We had great fun playing with these amazing new toys many of which are available now. Last Christmas saw stock shortages of the LeapPad and Innotab children’s learning tablets and this year the tablets have been re-released packed full of extra fun features. These are again set to be one of the "must have" toys for 2012. 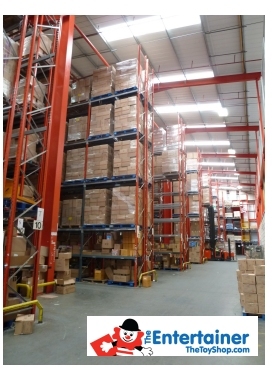 During the visit we were given access to their impressive warehouse and distribution centre which co-ordinates and sends online orders to customers and local stores (for click and collect orders). The Entertainer's warehouse was stacked ceiling high and bursting with toys ready for the busy festive period. 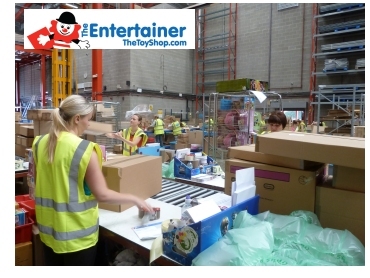 In readiness for the Christmas period The Entertainer will also soon be employing more seasonal staff to cope with the massive influx of Christmas orders they will soon be receiving via their website www.TheToyShop.com. Recently revamped The Entertainer's new website offers a great shopping experience with an excellent "Present Finder" search facility to help inspire those stuck on what to buy. A free "Click and Collect" service is available whereby you can order online to collect locally at one of the 71 Entertainer toy shops across the United Kingdom. This is beneficial as you don't have to stay in all day waiting for your delivery to arrive, you can just pick up your order at a time which suits you. The Entertainer is also doing it's bit to help the environment by reusing boxes they receive from toy factories. Wherever possible they will send customer orders in these recycled boxes with a green recycling sticker to indicate this. All stores also accept batteries and electrical items for recycling.